Last weekend my husband and I, along with my friend Jolie, headed up to Farmington Bay, which is just north of Salt Lake City for the annual Bald Eagle Day. Oh dear, it was a bit of a bust. I saw only a couple of bald eagles and they were flying around in the distance. Nothing my 300 mm lens would even be able to capture. There was one near the water and some folks had a scope set up with a crowd of people around it, but just as we drove by (we had just arrived), it flew away into the distance. Turns out this lovely mild winter we’ve been having means that the Bald Eagles are not desperate for food and aren’t coming down south for the carp. For some really lovely photos from previous Bald Eagle Days, check out Ron Dudley’s Feathered Photography blog. His photos rock! If I can’t get some decent photos of the Bald Eagles then why not look at someone else’s? So no Bald Eagles. They just weren’t cooperating with us. Well, we had two options: Call it a day and just go to In-N-Out Burger or head over to nearby Antelope Island to see what we could find there. We opted for Antelope Island. It was also pretty quiet at Antelope Island. 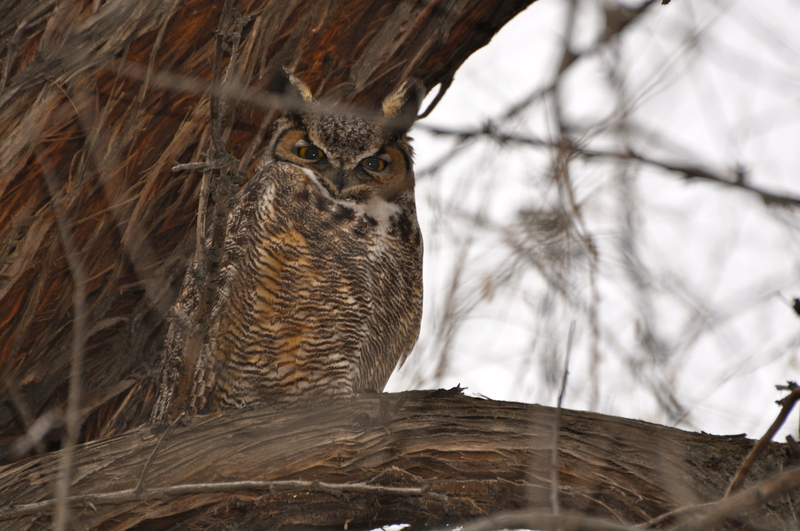 We headed to Garr Ranch in the hopes of seeing the pair of Great Horned owls that have been nesting there for the past several years. We walked around the perimeter of the forested area and Steve, who was a few yards in front of Jolie and I, spotted them immediately and then Jolie and I–each with cameras in hand–began our photo shoot. 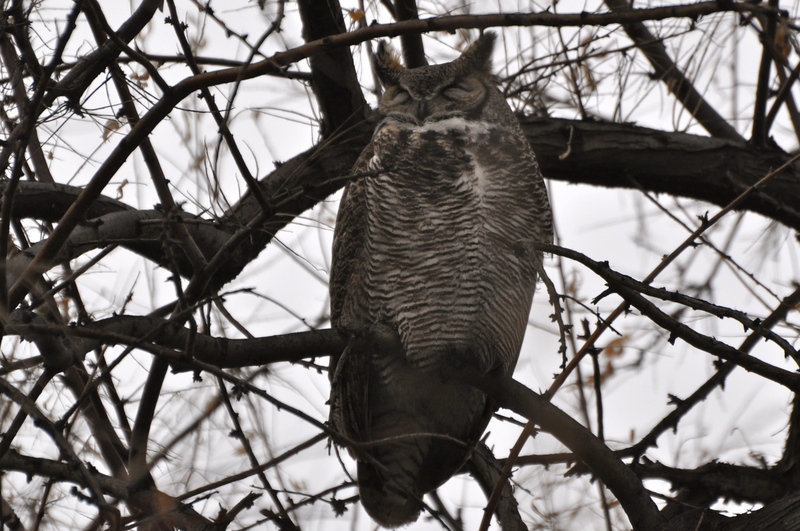 Crappy lighting (we should have been there a few hour before for better light) and the pesky owls were hiding behind twigs and such. They, too, weren’t exactly cooperating. At least they stay still. Warblers, I’ve discovered, are the least cooperative in the bird family. 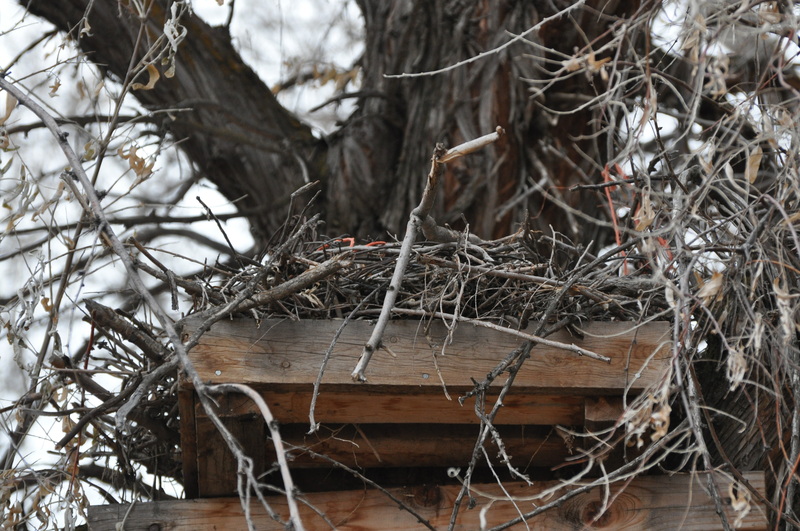 Their nest should they decide to have a family this year.